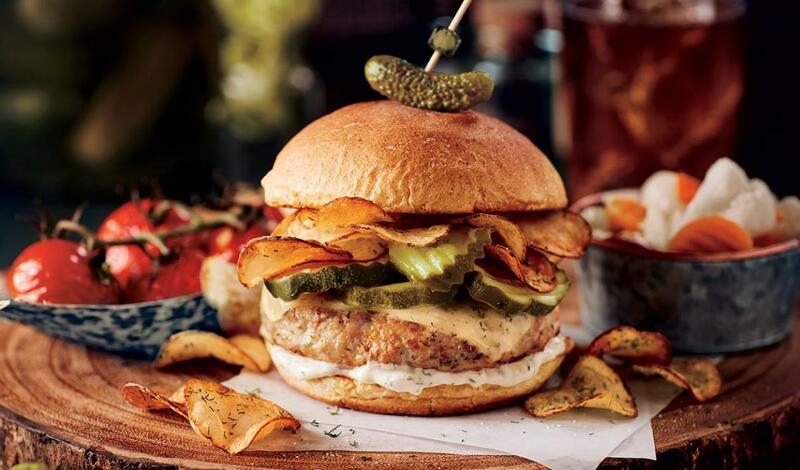 An herb-seasoned ground chicken patty topped with dill Havarti, dill pickle slices and crunchy dill pickle flavored potato chips, with a cool and zesty cucumber chili mayonnaise. Squeeze excess moisture from the grated cucumber. Place in a strainer and lightly salt, tossing to coat. Allow to stand for 15-20 minutes, and then squeeze again to remove moisture. Combine with Hellmann's® Real Mayonnaise, dill, chili powder, cayenne and lemon juice. Season with salt and pepper, if desired. Refrigerate overnight. Combine ground chicken, parsley, dill, garlic powder, salt and pepper and mix well to incorporate. Form into 10 patties. Hold refrigerated for service. To assemble, spread 1 Tbsp CucumberMayonnaise on each side of the bun, then add grilled chicken patty and dill Havarti. Top with pickle slices and dill flavored potato chips. Serve.